Using structural knowledge of Cas9, scientists have overcome a key CRISPR-Cas9 genome editing hurdle and developed a highly specific genome-editing tool. 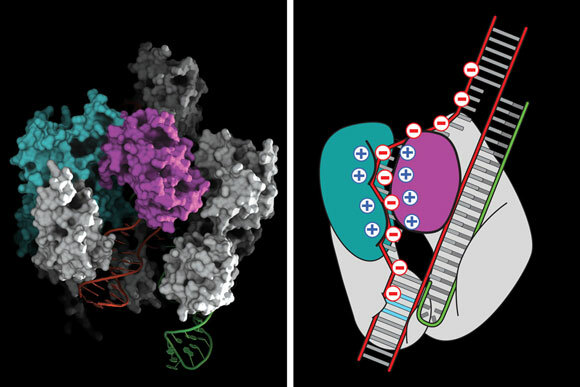 The CRISPR-Cas9 system works by making a precisely targeted modification in a cell’s DNA. The protein Cas9 alters the DNA at a location that is specified by a short RNA whose sequence matches that of the target site. While Cas9 is known to be highly efficient at cutting its target site, a major drawback of the system has been that, once inside a cell, it can bind to and cut additional sites that are not targeted. This has the potential to produce undesired edits that can alter gene expression or knock a gene out entirely, which might lead to the development of cancer or other problems. Be the first to comment on "Scientists Overcome Key CRISPR-Cas9 Genome Editing Hurdle"